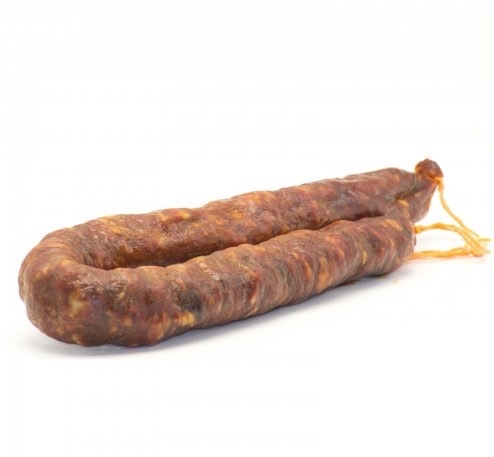 We’re delighted to introduce our exclusive new product: Organic Calabrian Black Salami! 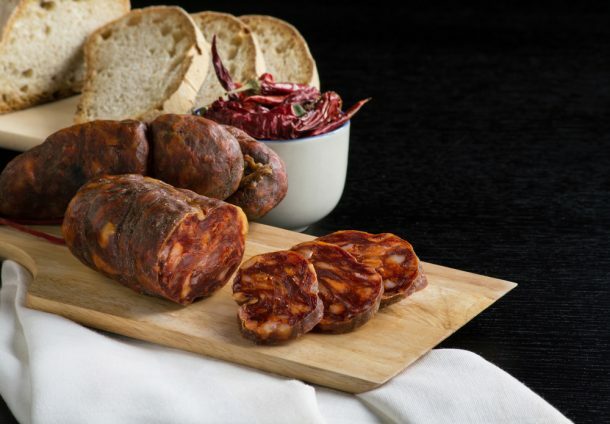 Vorrei’s latest, exclusive products; including Soppressata, Salsiccia and the infamous ‘Nduja sausage are all derived from Calabrian Black Pigs. Reared by artisan producers in the wilds of Calabria, on Italy’s metaphorical ‘boot’ in Southern Italy, this cured pork is truly some of the best in the world. To help introduce the new products, we’ve put together a small guide below, answering some commonly asked questions. Why is Calabrian Black cured pork so renowned? Calabrian Black Pork is celebrated in Italy because of its high levels of monounsaturated and polyunsaturated fatty acids of the omega-3, omega-6 and omega-9 family. In simpler terms, it essentially means that the pork has higher levels of healthy fats – 28-38% more than your average salami to be exact! This means the pork is far healthier for you in terms of cholesterol levels and is even rumoured to be as healthy as tuna and salmon! 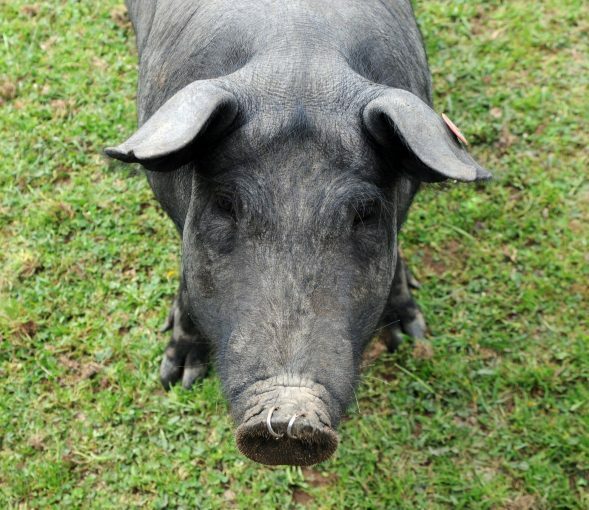 What are Calabrian Black pigs? Brought back from near extinction by small scale farmers, Calabrian Pigs are an animal that must be bred with care and patience. Slow to grow, Calabrian pigs are not designed for intensive breeding, with farms having no more than 100 pigs at a time. It’s their slow growth and diet that lend themselves well to cured meat, as it doesn’t shrink as much when cured. 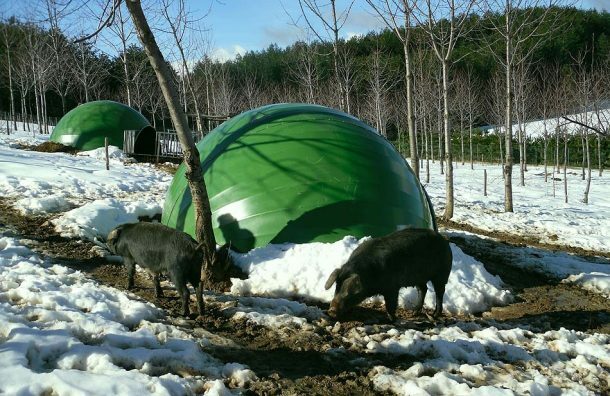 Our producer, Azienda Agricola Romano has been breeding Calabrian Black Pigs since 2009. 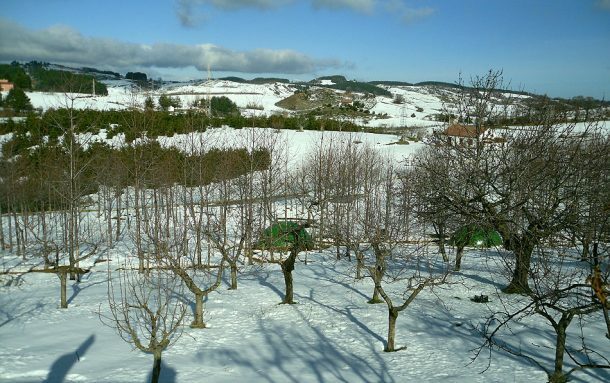 Their 1,100m territory in the Sila National Park offers the ideal environment for breeding the native pig. Feeding on a diet of only those things found in the wild, including acorns, chestnuts, vegetables and olives (these pigs have excellent taste!) the meat is tender with an intense, natural sweet flavour. A particularly spicy, finely minced spreadable salami, this is an addictive product to add to your kitchen cupboards! 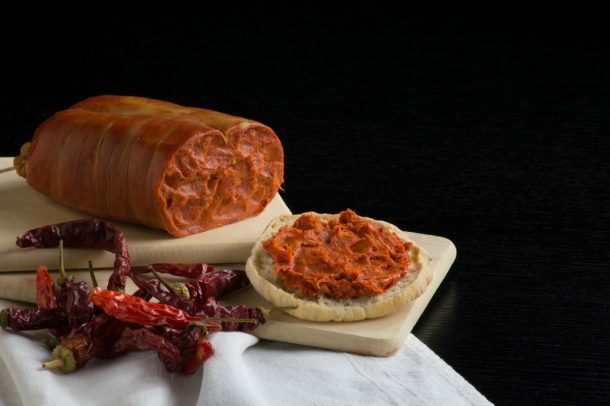 Seasoned and left for 40-90 days, ‘Nduja is deliciously chewy. Unlike the usual ‘Nduja you’ll find, which is often bright orange in colour, this cured meat is much darker – a sign of less fat and more meat content! Just how we like it. One of the best things about ‘Nduja is its versatility. Paired with bread, sprinkled on pizza, mixed in with roasted potatoes or used in pasta, this is a handy cured meat to have. The most popular Italian salami, Soppressata is made from the finest slices of Calabrian pork – usually the shoulder or rib cuts. It’s slightly flatter shape is due to being pressed under stone rocks before being cured. Less spicy that its ‘Nduja counterpart, the meat is added with black and sweet peppers, which gives the meat its distinctive flavours. Soppressata is almost always served as an appetizer in Calabria and is often eaten with cheeses like Pecorino and washed down with a local wine. It’s also enjoyable paired with tomato sauce (once simmered) in a pasta dish. Holding ‘DOP’ status, our organic, free range Calabrian Salsciccia is taken from the shoulder or ribs of the pig and mixed with hot Calabiran chillies! Dried and left to cure for 45 days, the meat is left with an intense spicy flavour. For those who prefer things milder, we have also introduced, the Salsiccia ‘Dolce’ i.e. without the chillies)! Crusty bread and a glass of red wine! It also makes for a delicious pizza topping and used in pasta dishes. 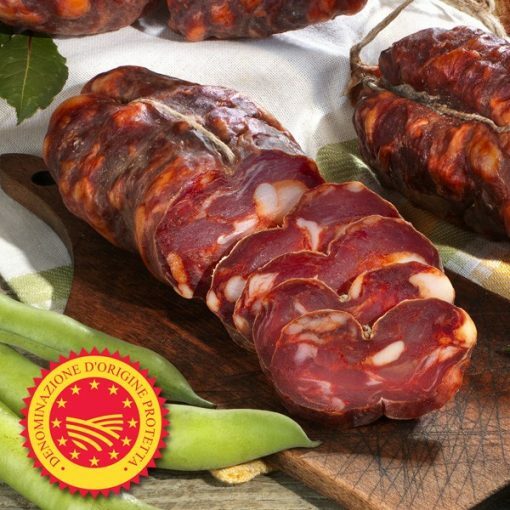 We are incredibly excited to be exclusively selling this delicious range of organic, free range Calabrian Black salami. 100% natural, with healthy fat benefits, this selection of pork is a cupboard staple!